EdgeRift’s Emergency Radio turns your iPhone into a police scanner. By delivering hundreds of live streaming police, fire, and EMS radio channels to your mobile device, the $1 Emergency Radio serves a unique function for iPhone and iPod touch owners. Know the Code: While you listen to a live stream of police, fire, and EMS radio channels, Emergency Radio displays a scrollable list of codes so you can follow along. When you open Emergency Radio, the first thing you’ll see is a list of all available police, fire, and EMS channels in alphabetical order by city. Hundreds of channels appear on the list, including several for larger cities where police, fire and EMS each have their own channels. (Smaller cities and towns often use one channel for all three.) When you select a channel from the list, the app switches to its Now Playing screen. 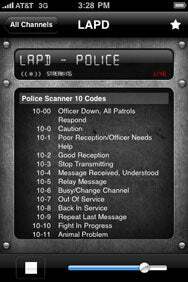 While the audio stream is playing, the screen displays a very long, scrollable glossary of police scanner “10 codes,” allowing you to look up codes as they’re called out to better understand what you’re hearing over the radio. The Now Playing screen also includes a stop button, a volume slider and an Add to Favorite Stations button to bookmark any station for easy reference later. With hundreds of different streams, you can listen to everything from the relative slowness of an afternoon in small town Kentucky to the hustle and bustle of the LAPD with a tap of your finger. The amount of streams available to you is almost overwhelming. To help you navigate through all those streams, Emergency Radio includes a search box at the top of the channels screen. While the search box is easy to use, it is essentially the only way to navigate the list of channels. While you can scroll through the list with a flick of your finger, there’s no way to jump back to the top of the list quickly. Some method to return to the top—a Contacts-like alphabet directory or even a simple tap across the top of the screen—would be welcome. The audio quality in Emergency Radio varies depending on the quality of each feed. All feeds are broadcast over the Internet and, as such, any number of variables can affect a stream’s quality. It’s also worth noting that not all listed channels are available all of the time, though that’s a result of the streaming process and not a defect on Emergency Radio’s part. During my tests, the quality varied from stream to stream but streams from larger cities were generally clearer than their small town counterparts. On average, the audio quality was relatively clear, especially given that you are using a mobile device and moving frequently while doing so. In addition to the main screen’s available channels and now playing screens, Emergency Radio contains two other tabs: Nearby and Favorites. The former taps into the location features of the iPhone and iPod touch to identify and display nearby feeds. Favorites stores any bookmarked feeds for easy access. Emergency Radio essentially allows you to carry a police scanner with you at all times. Anyone interested in law enforcement or just looking for another “look what my iPhone can do” application should check it out. Emergency Radio is compatible with any iPhone or iPod touch running the iPhone 2.2.1 software update.